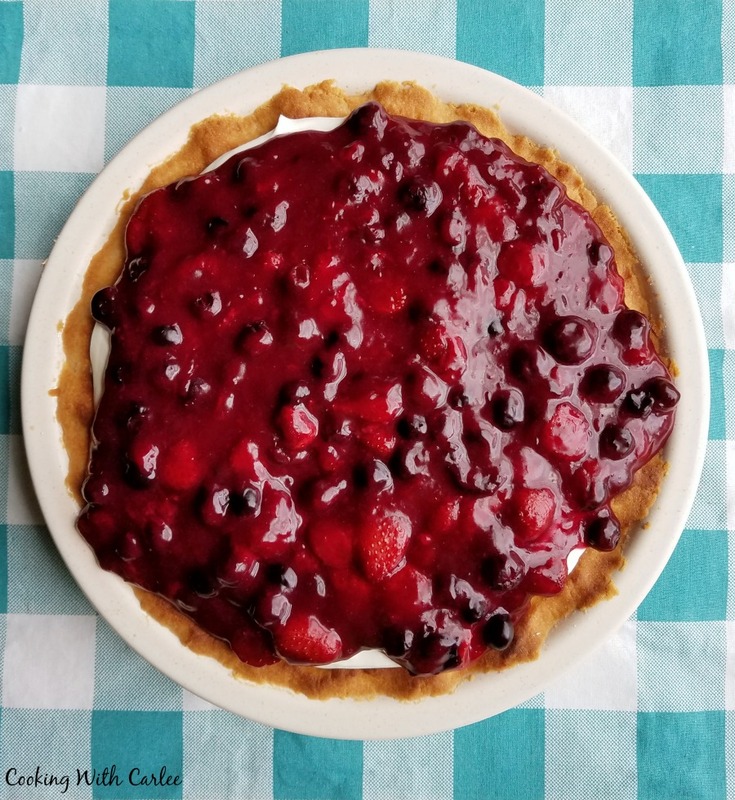 A creamy lemon filling topped with berries and nestled in a shortbread crust is the perfect pie for spring and summer. Refreshing, delicious and fun! 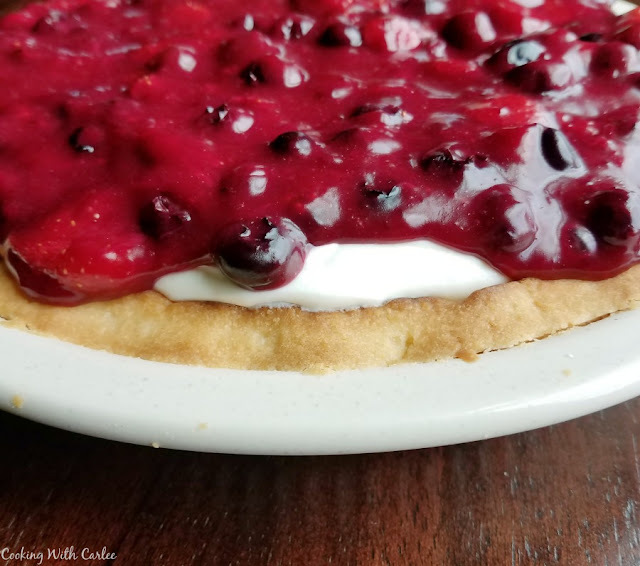 I figure it is about time to tell you a little more about the pie I entered into our Great Pie-off. As usual, I had the hardest time deciding what to make. I spent a ton of time looking at recipes trying to get some inspiration. In fact I had my mind made up a bunch of times. Some sort of chocolate peanut butter pie sounded amazing. In fact a couple of gems showed up in my Facebook feed that I would have happily made and eaten. Next I thought I might make a peach pie with a crumble topping. Something full of brown sugar and buttery crumbles with some warm cinnamon notes. Doesn't that sound good? I even went so far as to pick up a few pounds of frozen peaches so I could make it. Luckily little dude has been begging to make some Spiced Peach Preserves for his morning toast, so they will certainly not go to waste! I was really tempted to do a coconut cream pie, but I know coconut has lovers and haters and I wanted everyone to love my pie. My husband suggested peach rhubarb, which sounded like an interesting premise. I should probably make him one soon anyway, but I wasn't sure I wanted to go there for the big competition. So of course with just a day or two until the big showdown I had to do something! So I did what I do best and winged it! I knew some of the competitors are known for their flaky, pretty pie crusts. I am not known for those things, I really don't bake pies all that often. So I thought I would go with a shortbread crust to set myself apart a little bit and take off the pressure of living up to their pastry standards. Plus with a shortbread crust you can pat it into the pan rather than roll and crimp and the like. Score! For the filling I knew I wanted something light and airy, something easy and cool. I wanted it to have a hint of lemon and a creamy feel. So I whipped up some cream cheese, sour cream and plenty of heavy cream and added just enough lemon to really brighten it up. It is such an easy pie filling and definitely lick the bowl worthy! First I was going to do a blueberry topping because lemon and blueberries go so well together. Then I was going to do strawberries because our little patch has been producing berries and it doesn't get fresher than picked in the backyard today. In the end, I decided to use both! So I reached back to the recipe for my Two Bite Berry Pies and modified it to make a topping that I knew would stay put, showcase the berries and help balance my not to sweet not to tart pie. I will apologize that I don't have better pictures of this pie. I didn't want to cut a slice before the competition, though I guess in retrospect it wouldn't have hurt anything. In our haste to serve a bite of each pie to everyone that was here, the pies got pretty well butchered. So I did the best I could to quick sneak a picture as we were going. I contemplated not posting it due to lack of pictures to choose from, but this pie really turned out well if I do say so. So good that I will likely make it again and hopefully update the pictures. But our weekends are pretty busy from here until forever it seems, and I am not sure when I'll have the chance to make another one so I wanted to give you the recipe now. We can worry about the rest later! 2. Stir together the flour and powdered sugar. 3. Add the butter and vanilla and mix until crumbly. 4. Turn into a deep dish 9" pie plate and push against the bottom and edges to form a crust. Flute edges if desired. 1. In a large sauce pan toss berries with sugar and cornstarch. 2. Stir in lemon juice and water. 3. Heat over medium heat, stirring constantly until the mixture thickens to the texture of pudding. 2. Add in powdered sugar, lemon extract and sour cream, again whipping until smooth. 3. With the mixer running on low slowly drizzle in the really cold whipping cream. Once all of the cream is added, turn the mixer to high and beat fluffy. 4. Pour into cooled pie crust and smooth out the top. Refrigerate until firm. 5. 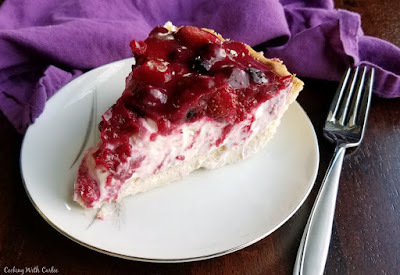 Smooth room temperature berry filling over cold pie and serve right away or refrigerate until ready to serve. This looks amazing. I'm afraid I'd use a graham cracker crust so I could make it easier, but yours sounds so much better. Light and cool is what we need around here with the temps in the 100s. A graham cracker crust would work perfectly! I just had my heart set on shortbread as soon as my mind went there! 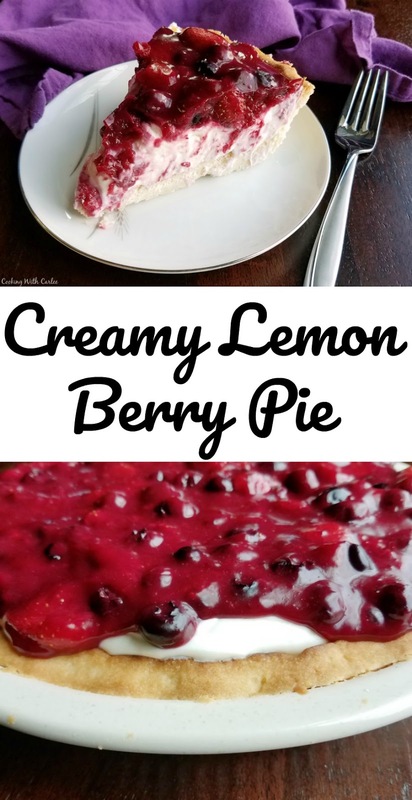 I adore this flavor combo and don't make things with cherries and lemons together nearly enough! I adore how light this is for summer and a super refreshing dessert! Carlee your pie is awesome! I really like the idea of combining blueberries and strawberries with lemon. Just perfect and not that common. I love pies too, but I'm not great at traditional pastry. So, I'll give your shortbread crust a try. It sounds really yummy. Thank you so much! I love pies, but my crusts never turn out as pretty as I would like. I am certainly not an artist. I love the ease of just pressing the crust in and baking and it held up to the filling nicely! Ohh I can only imagine how delish this must be Carlee. The combination of the cherry and the lemon must give it a somewhat tart flavor. I also add lemon to my apple pies and they come out yummy. I'll have to try this one! Thanks, Mary! 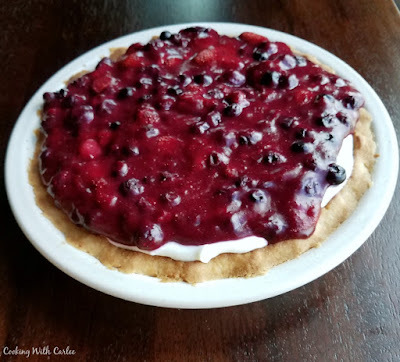 I love berries and citrus together, so it was a shoe-in for me! This sounds freaking amazing! I love the color and LOVE the flavors you have going on. This is total summer dessert perfection, Carlee! Thanks, Kelsie! I really enjoyed it even if it didn't win me a spot on the trophy! My little dude said it was the best pie he ever had and helped himself to a nice sized slice of what was left, so that is good enough for me! Oooh, Carlee, it sounds so cool, creamy tart! And pics are weird! Sometimes I think some of my posts don't do good coz my picture is awful, but then sometimes I have a post go just about viral when it has the worst pic! I think your pie looks delish and it's going on my must make list! Isn't it funny how that works? You just never know what is going to take hold, that is for sure! Hi Carlee, this sounds like a cheesecake with a difference and I do like a good cheesecake. I do like a shortbread crust too as it's so easy to pull off. I bet your pie went down a treat and your photos are just fine! Thank you, Debbie! It is kind of like a really light and fluffy no bake cheesecake in the middle. I really liked the mix of textures and flavors, but I am probably a bit biased!